This is an area where few dare to tread. Because it is so personal! We all have our favorite place to position our rearview and side mirrors. Have you ever stopped to think there might be a better way? Today we are going to explore some options that might help you see a little better and by default, keep you a little safer on the road. Nearly twenty years ago a paper was written by the Society of Automotive Engineers proposing adjusting side mirrors in such a way as to reveal the blind spots without having to add those little circle mirrors to your side mirrors or purchase any after-market items. These adjustments are made by using your rearview mirror as the centerpiece of the matter. 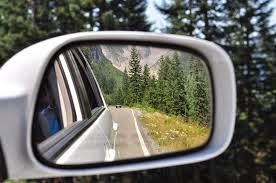 You adjust your outside mirrors on either side outward such that your viewing angle on either side view mirror just overlaps the outside edges of each side of your rearview mirror. By doing this you have now expanded your review, literally to the point of being able to see in your blind spots. This type of adjustment takes some getting used to as many people often use their side view mirror as a rearview mirror. Now take a moment to reread that sentence. Doesn't that seem silly? Your side view mirrors are for the sides and your rearview mirror is for the rear. Duh (forehead slap)! What’s even funnier is that you’re probably going to try this out today and then quickly decide to go back to your previous ways. That’s fine, we simply thought we would pass on this information to enhance your visual awareness when driving and hopefully increase your safety on the road. Our job is to deliver the information. Now it’s on you whether or not to do something with it. For this and other tips on how to improve your vehicle visit us on the web at www.olympiaautomall.net . The Olympia Auto Mall is your premier choice when looking for the best new or used cars Tacoma has to offer! As blind spot accidents can be quite devastating. I think we should be more cautious about that. This article helped me a lot. I will fix my blind spot mirror at the right place sooner. We have to use too many new things in the market and after we decide that it would be good or bad for us. Recently i heard about Blind spot mirror and also wanna try it for my new car to see a better rear side image..